Beautiful plan of central London. Cruchley's New Plan of London. 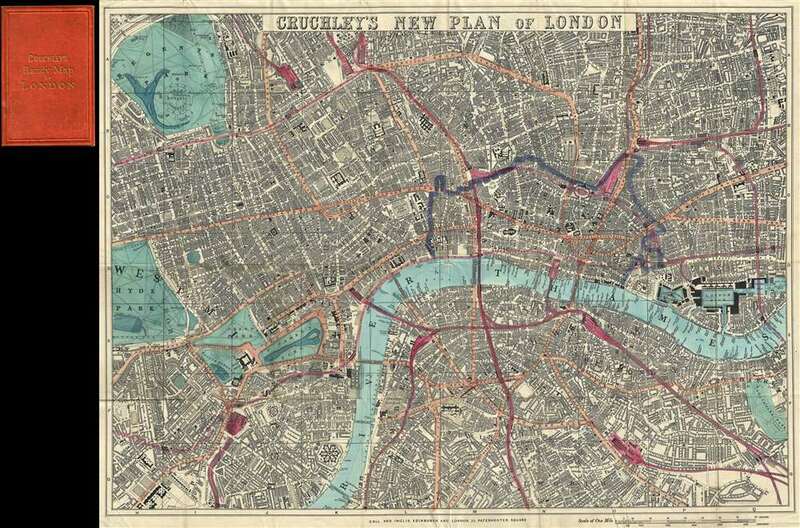 A beautiful first edition example of George Frederick Cruchley's 1860 pocket map of London, England. Centered on Blackfriars Bridge, the map covers from Regent's Park to Chelsea Hospital and from Hyde Park to Southwark Park. Streets, bridges, wharfs, docks, parks, the imprints of important buildings, and railway stations are identified throughout. The map gives particular attention to the railroads, highlighted in red, that were being developed throughout London at the time. A purple border outlines the City of London. This map was printed by Gall and Inglis of 25 Paternoster Square for George Frederick Cruchley. Very good. Fold into original binder. Hyde, R., Printed Maps of Victorian London 1851 - 1900, no. 66.1.